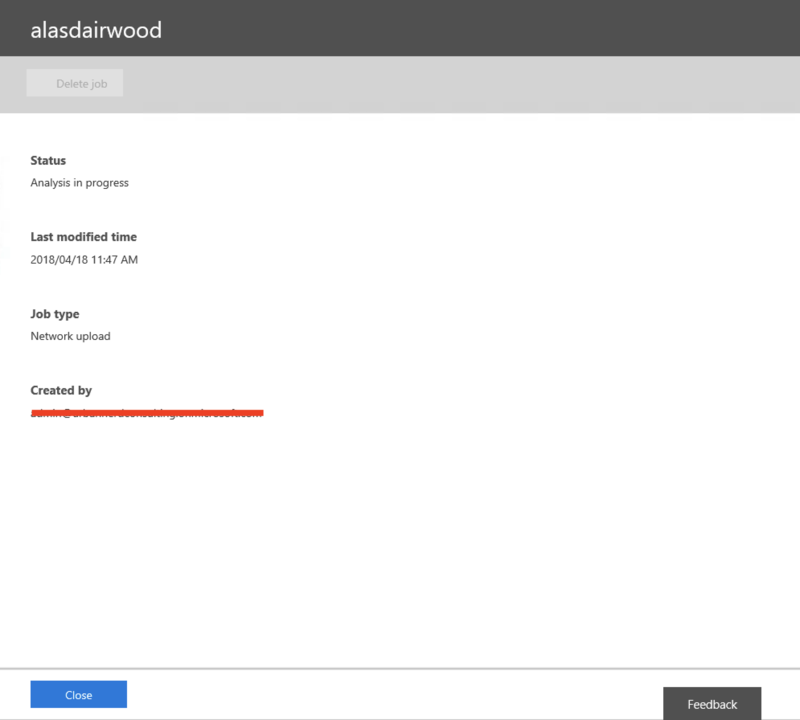 To start the Process, login to Office 365 as a Global Administrator. 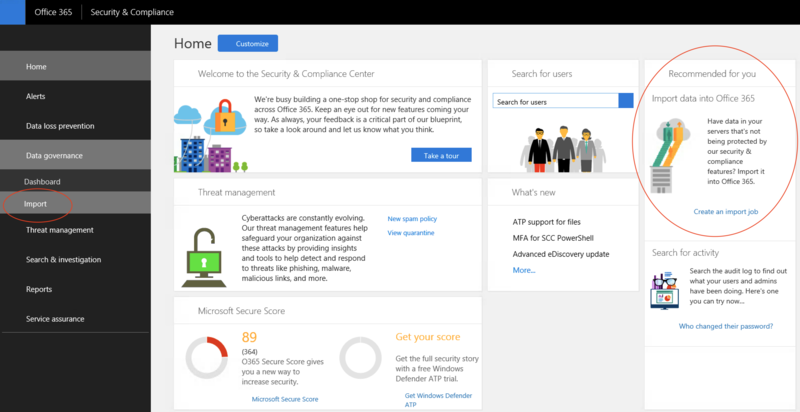 Once logged in Navigate to Security and Compliance. Ps. You can also click on “Create an Import Job” from the Dashboard of the Security and Compliance Centre. Before you can start with the Import job creation, the Administrator needs to be assign the permissions to Import and Export the Mailbox. 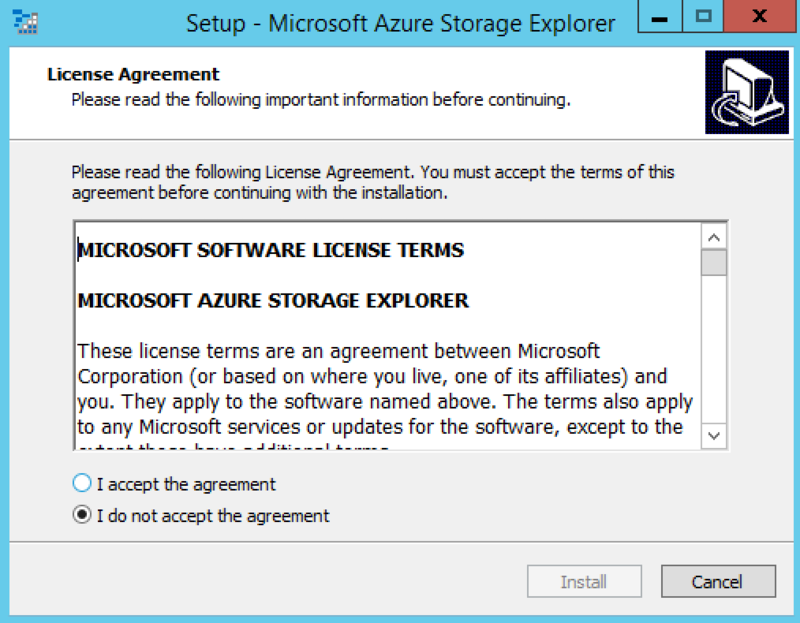 By default, these permissions is not assigned to any administrator. 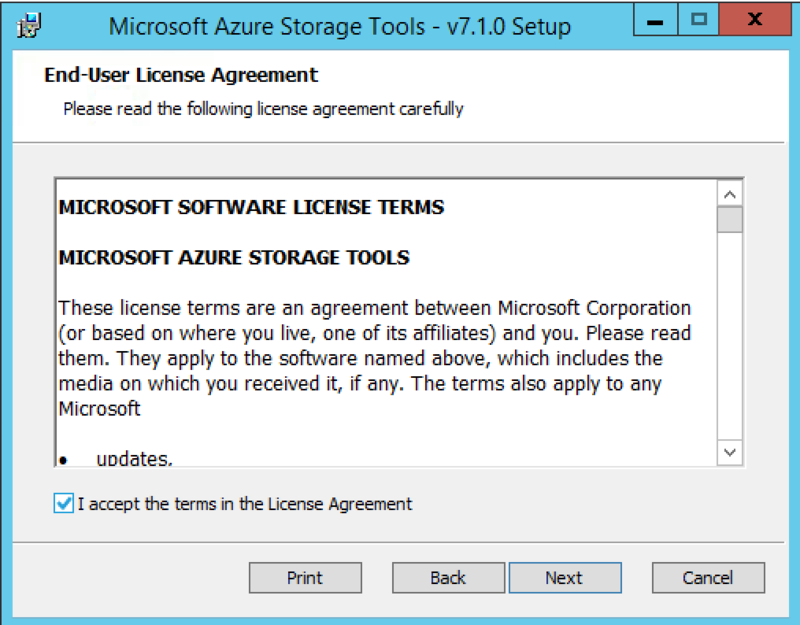 To assign the new permission, do the following. 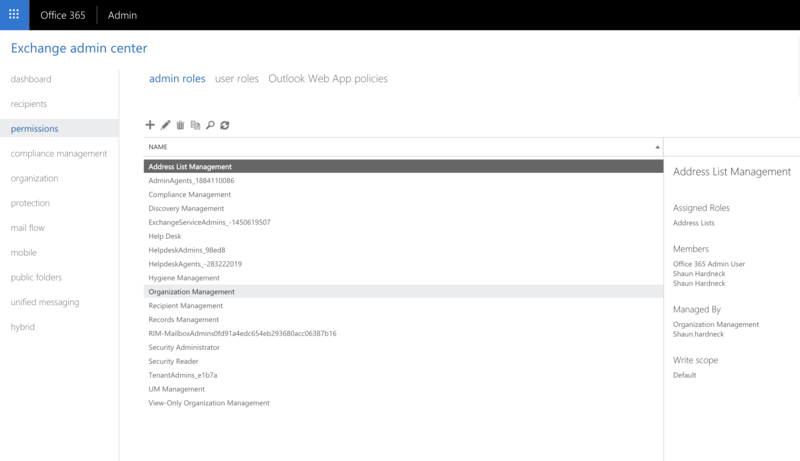 From within the Organization Management Role, click on + under roles. 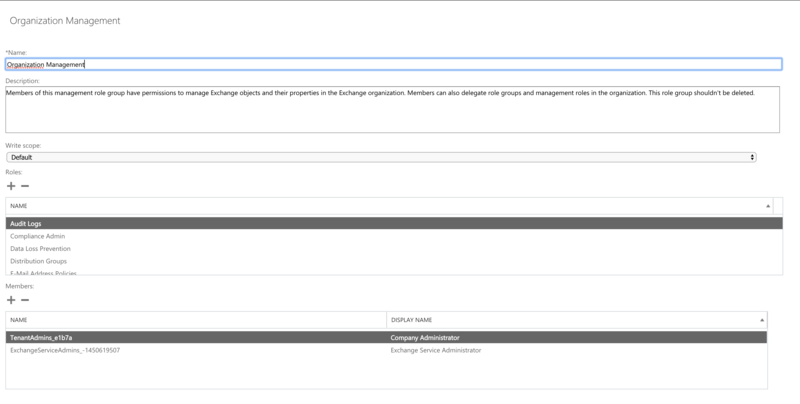 Click on Save, to save the changes made to the Organization Management Role. Now that the permissions have been assigned, navigate back to Security and Compliance Centre and click on Data Governance and Import. 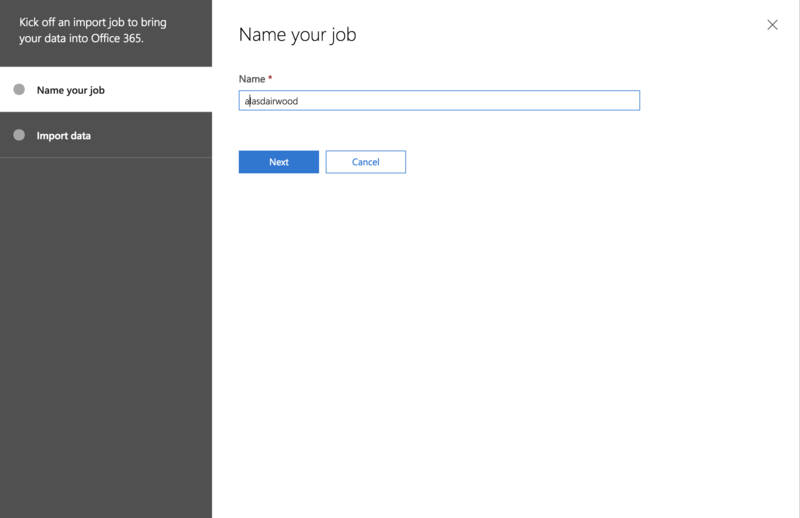 New Import Job wizard will start, provide a name for the Import Job and click Next. 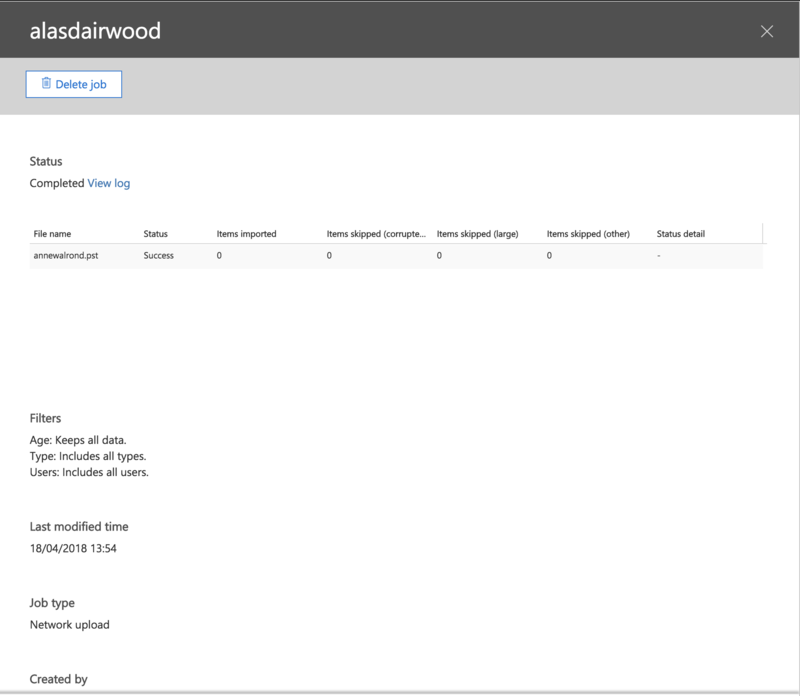 Next you have an option to select upload or Ship a drive to a physical location. 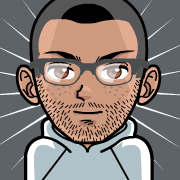 For the purpose of this blog post, I will select Upload and click Next. From the next screen is where the FUN starts, Click on Show network upload SAS URL. This is the destination where you will be uploading your PST files to. 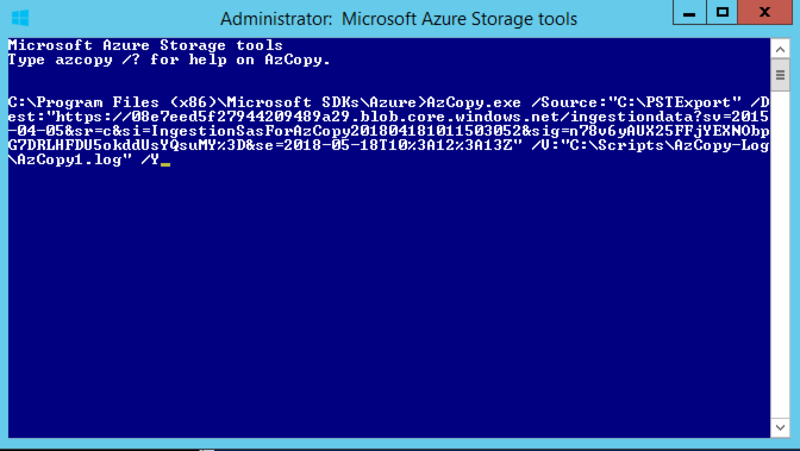 Click on Download Azure AzCopy, this is the Tool which will be used to upload the Data. 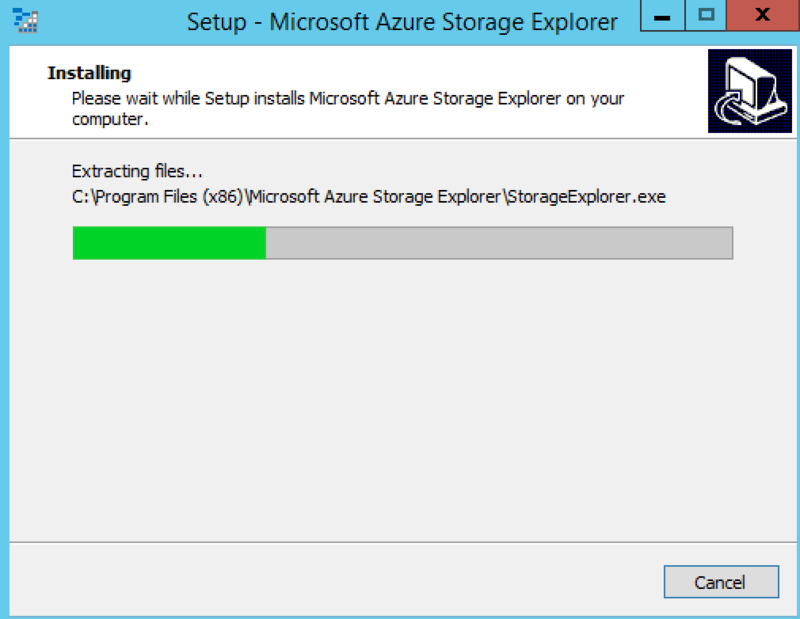 Once the Download completed, Run the setup for AzCopy. 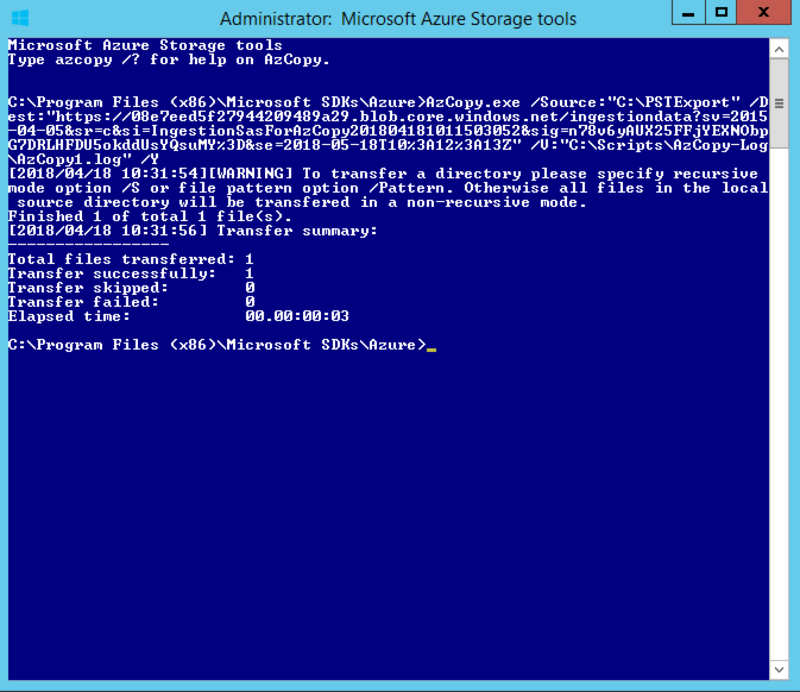 To start the upload process, open the AzCopy Tool and use the following script to run the upload. Ps. 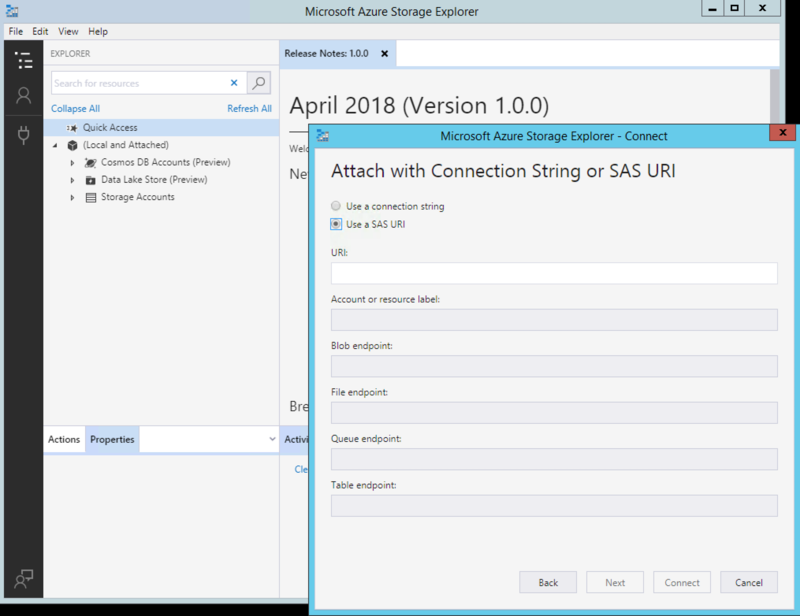 Change the Source to a UNC share that has the PST files and change the Destination Url to the SAS Url provided in the above steps. 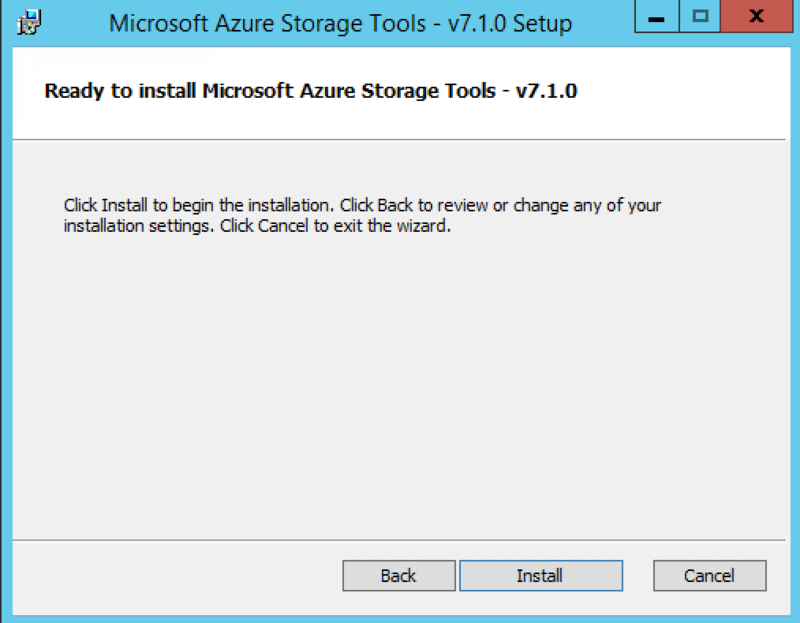 The Azure Command Line Storage Tool looks as follow. 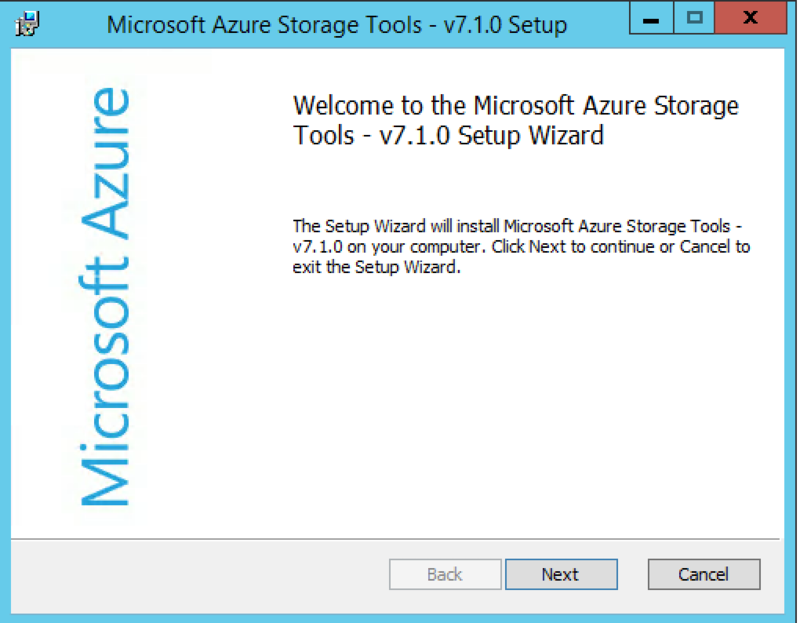 Next use the above provide script and past it into the Azure command line tool and press enter. As you can see, I have tested with a small PST file and the Upload completed successfully. 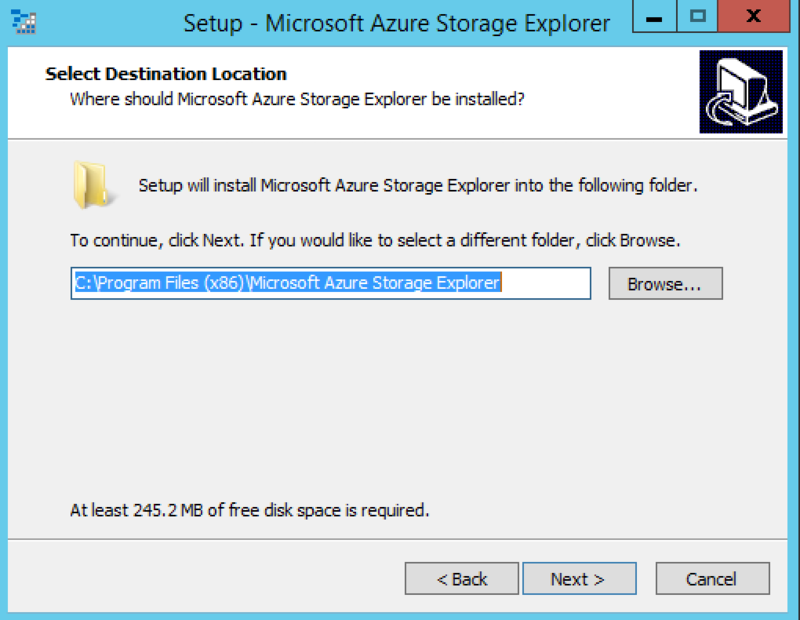 To view all files that has been uploaded, Install the Azure Storage explorer which can be downloaded from the below link. 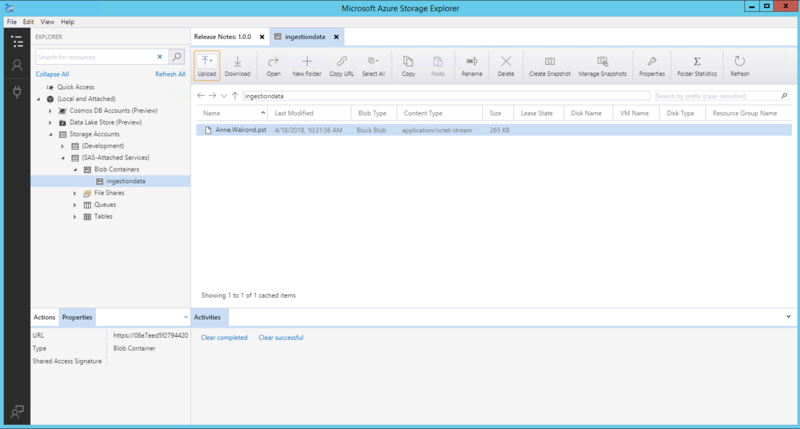 Click on Download Storage explorer. 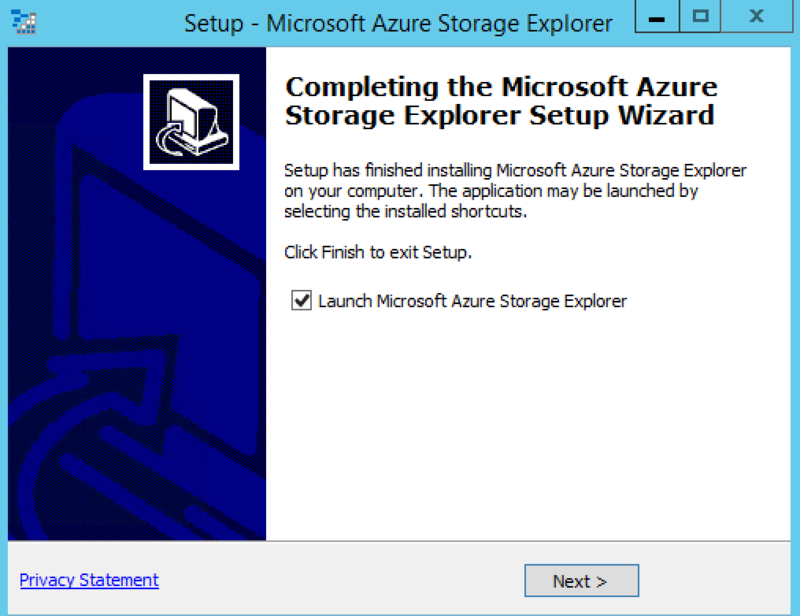 Start the installation of the Storage explorer. 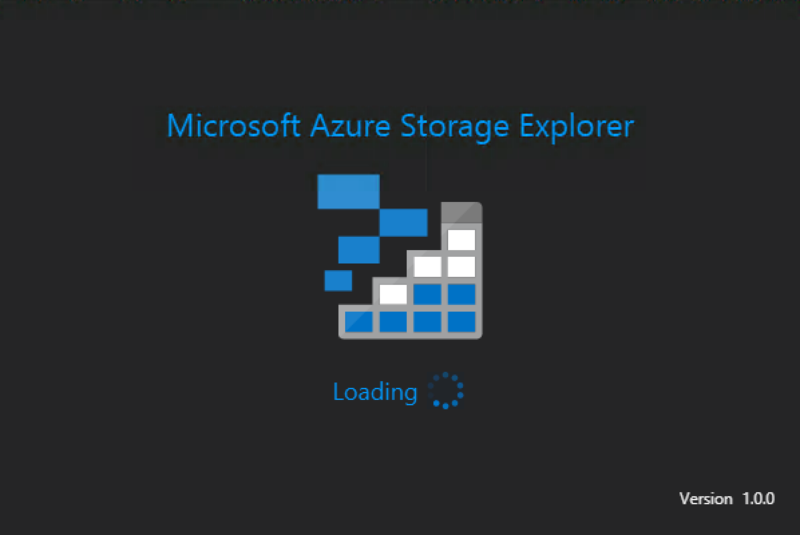 From the Home Screen of the Storage explorer you will be presented with a screen to create a new connection. 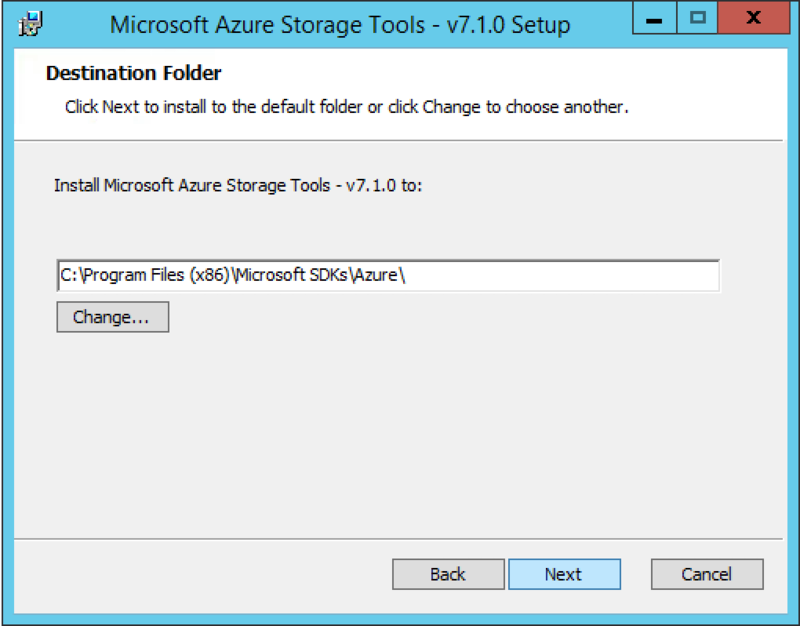 Select “Use a SAS URl”, this is the link provided during the steps on top. Once the link has been copied in to the URl space, the rest of the details will auto complete once you click Next. 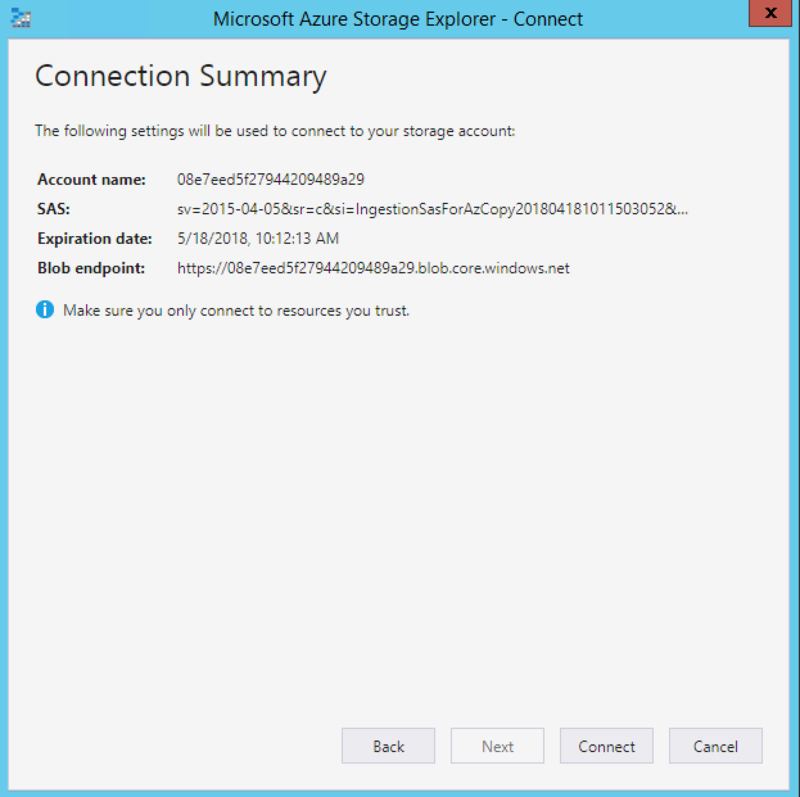 On the Next page, you will be presented with summary, click Connect to establish a connection to the Blog storage. Once the connection has been established, you will be able to see the imported data under blob containers. 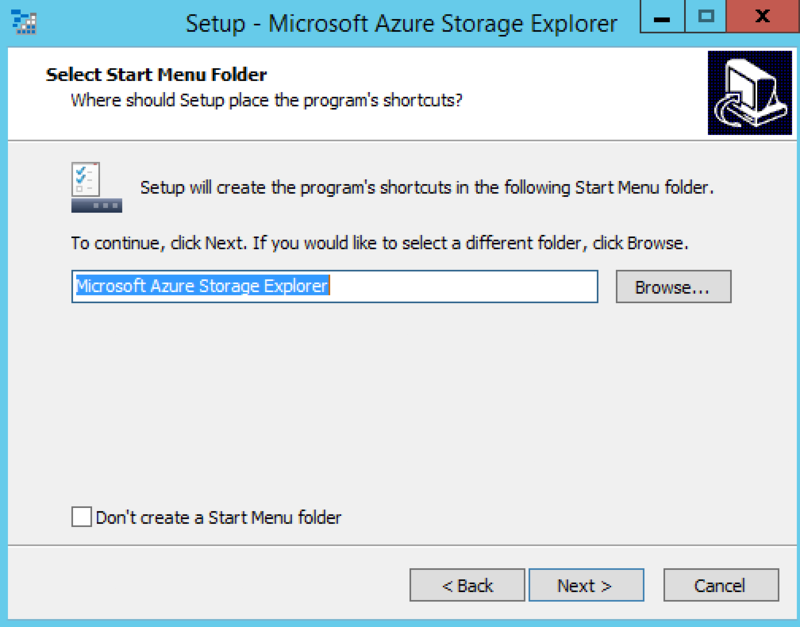 Now, that a file has been uploaded and is visible you can continue to move on to the next steps which is creating a mapping file. 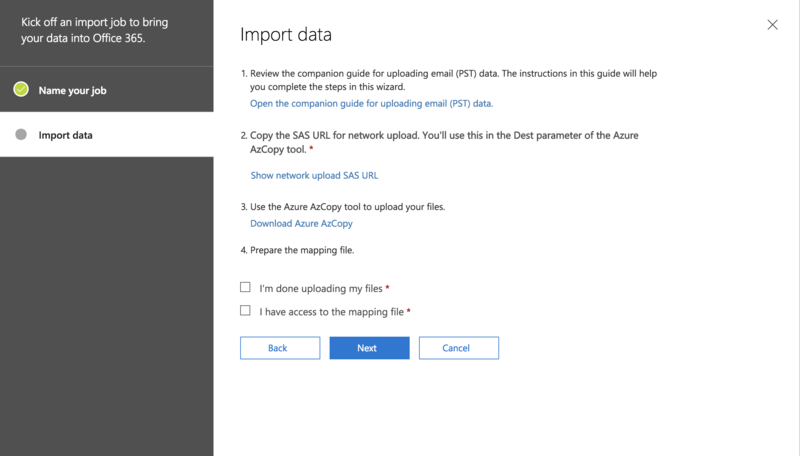 A copy of the mapping file can be downloaded from the Microsoft website. The mapping file will look as follow. Here is an example of a modified mapping file. Next, we need to complete the Import Job process which was started at the beginning of the blog post. 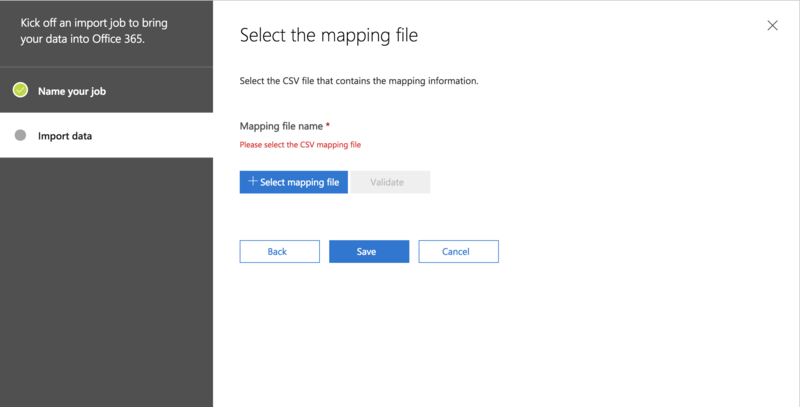 Select the mapping file during this process and click Validate. 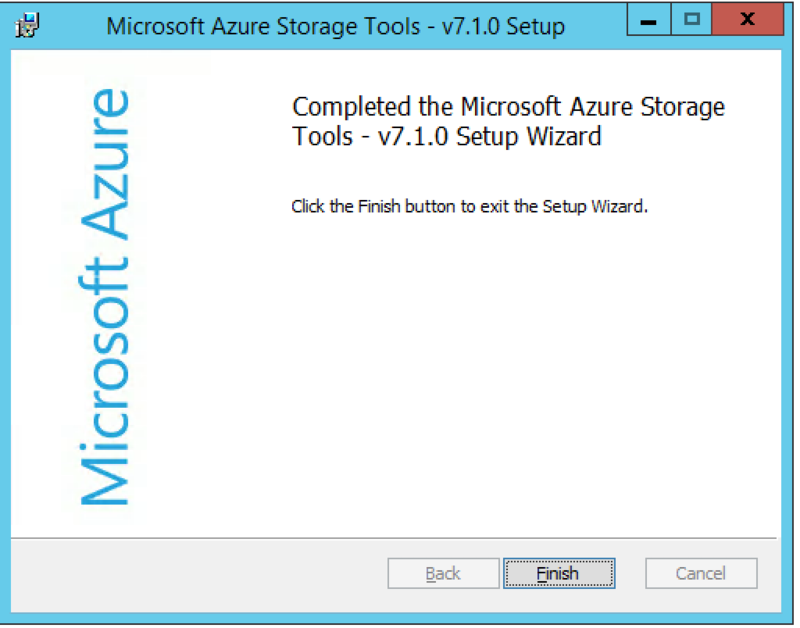 Once the validation process completes, click on Save. Once you click on Close, the Status on the newly created Import Job will open and looks as follow. 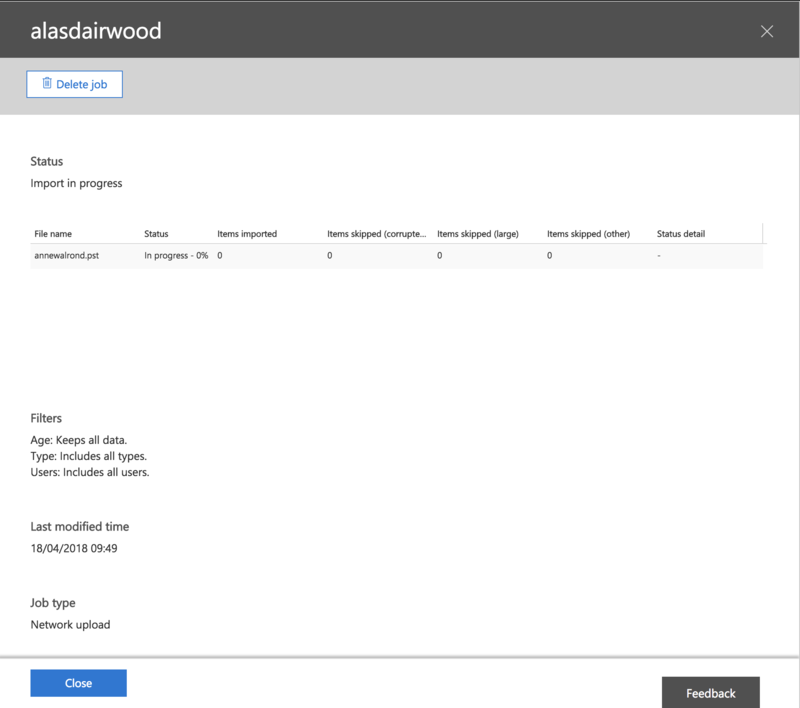 On the Import Job Dashboard, you will see that the Import job which was created is ready to be completed. 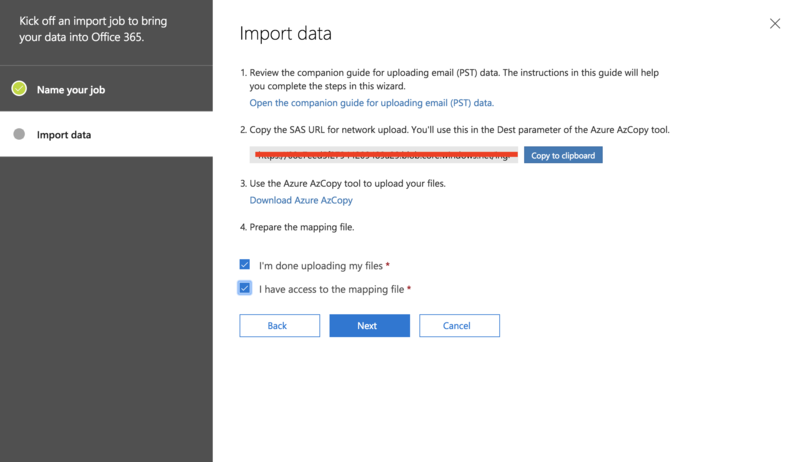 Click on “Import to Office 365”, from the Top Left-Hand corner. On the Import screen, you have an option to filter the data that you want to import. For the purpose of this post, I will select no and import all data and click next. On the last screen, you will have a view of how much data will be imported to the mailbox. In my case there is none , just an empty PST file. 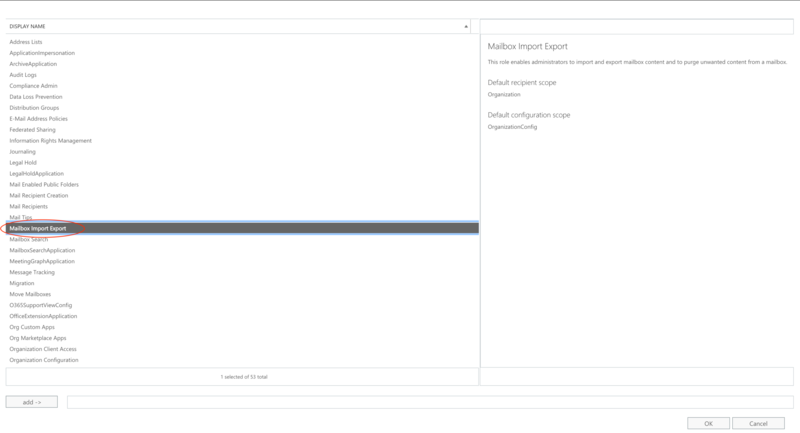 Click on Import data to start the process. When your import is successful, you will see the following screen. All of my 0 B data has been imported. Back on the Dashboard view, you can see that the import is busy running. Click on the Import Job to view the status of the data importing. 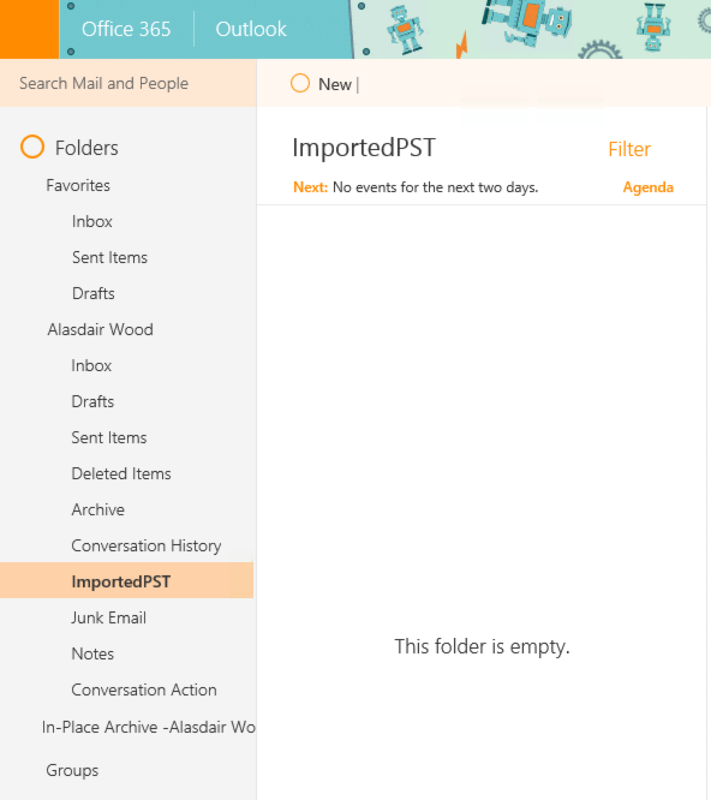 To verify if the newly imported PST file is visible in the user’s mailbox, logon to the Mailbox. As we can see from the image below, the PST file has been uploaded and the folder that we specified during the mapping file has been created. 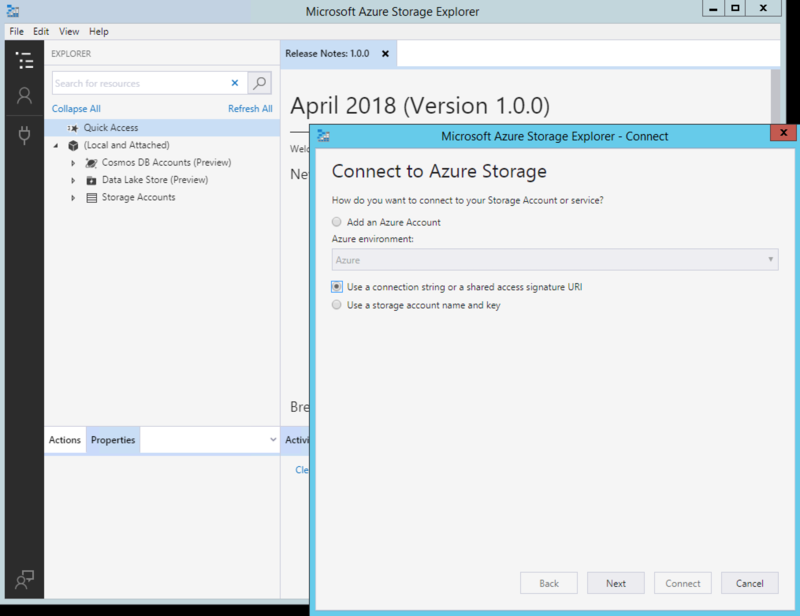 Once everything like storage explorer and storage cmd tools has been installed, the process to upload gets easier and quicker. 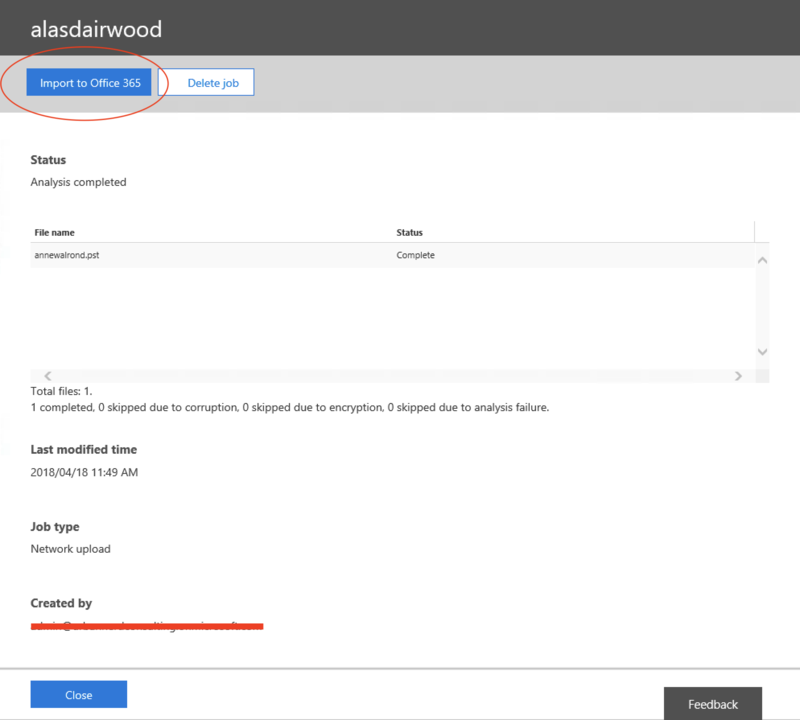 More details about the Upload and Import process can be found on the Microsoft Blog. 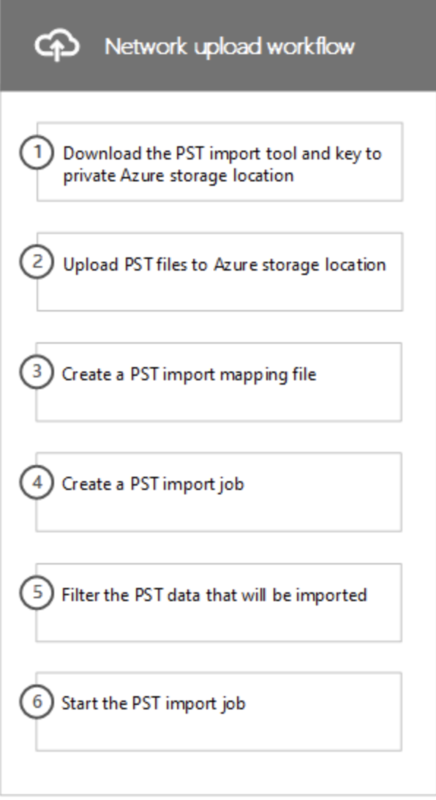 Thanks for posting such a great concept of importing PST to Office 365. 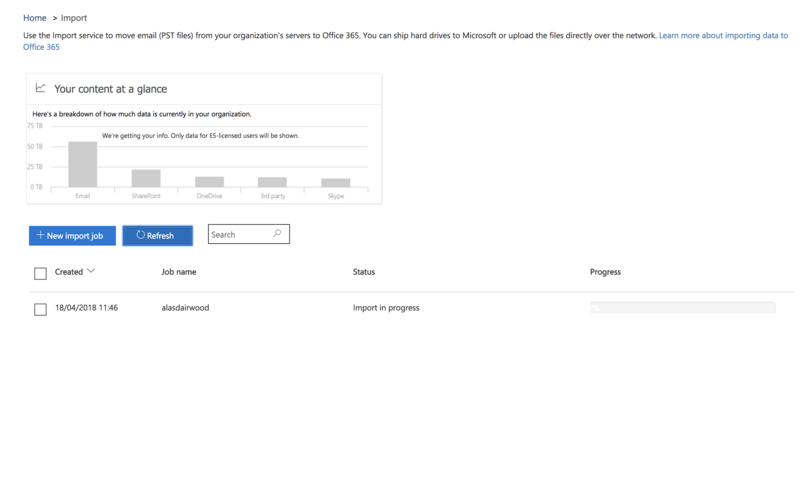 I used MailsDaddy PST to Office 365 migration tool for the same task and it also works very well for me.